Chronic dry eye, also known as dry eye syndrome, is a condition where the tears of the eye don’t properly lubricate the eye. This condition leads to symptoms that include burning, stinging and scratchy sensations of the eyes. Although it seems counterintuitive, watery eyes may also be a symptom of Chronic Dry Eye Syndrome! This is due to the nerves of the eye continually sending responses to the brain to produce more tears because the eye is dry. When a person suffers from chronic dry eye, it can affect the ability of the eyes to focus and cause the person to squint and strain their eye see clearly. This may cause some lifestyle alterations like difficulty to focus when reading, watching television or working on the computer. It may even hamper an athlete participating in sports that require hand/eye coordination. It’s a fact that in our modern world of computers, tablets and smart phones, more than 50% of all patients suffer from some form of Chronic Dry Eye – a modern day epidemic. In our society, the constant use of technology throughout the day, evening and into the night cause our eyes to become tired, stressed and irritated. Continual use of modern day technology significantly amplifies dry eye symptoms and discomfort. 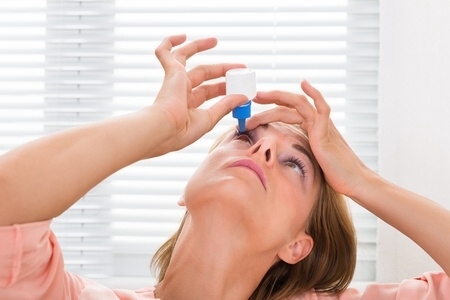 For years, patients with chronic dry eye have been treated with over-the-counter or prescription eye drops. While patients may find that eye drops help soothe dry eye irritation, they are not long lasting and only treat the symptoms. Treating the symptoms but not the cause does not solve the problem. We invested in the development of the Summit Eyecare Dry Eye Center with LipiFlow which includes cutting edge clinical science, instruments and technology that provide effective and long lasting treatments which are the most aggressive and effective treatments available today. Once our eye doctors identify the cause of a patient’s dry eyes, treatment options are identified and then applied directly to the root of the problem. One of our new devices, the LipiView digital imaging system, is used at Summit Eyecare to properly diagnose the cause of dry eyes. Before LipiView was available, eye doctors had no way to determine lipid (naturally occurring molecules) deficiencies in a tear. We are the first in the region to invest in this equipment. Absolute thickness of the tear film lipid layer. Meibomian glands under near-infrared (NIR) illumination. The ocular surface and eyelids under white illumination. Complete vs. Incomplete eyelid closure when blinking. This process only takes about 5 minutes and is performed at our Summit Eyecare Dry Eye Clinic in Idaho Falls on Pancheri Drive. During the process, the patient simply looks into a camera and blinks normally. The system’s special light, camera and computer program does everything else while you relax. The resulting data is particularly helpful to diagnose the cause of dry eyes and to determine the appropriate tear treatment. There are many potential causes of chronic dry eye or dry eye syndrome. One of the most common causes of dry eye deals with the oil glands of the eyelid. With the help of our new equipment, our eye doctors can determine if the cause is due to malfunctioning or diseased oil glands, buildup of bacteria, or something else that is causing blocked oil glands. Even incomplete blinking can cause these glands to under-produce the oil and lead to atrophy. In many cases it’s the oil glands in the eye lids that lose their proper function. A condition known as miebomian gland dysfunction (MGD). MGD is a condition where the oil of the miebomian gland is not released causing the tears to quickly evaporate. This condition, also known as evaporative dry eye, was traditionally treated by warm compresses and eye drops which were ineffective. Summit Eyecare has also invested in the LipiFlow system which is used to treat evaporative dry eye and rejuvenate those oil glands. This procedure is very effective in restoring the miebomian glands to their regular function with little to no discomfort. Review the following two minute video for more information. Other cases of dry eye occur with the buildup of bacteria on the eye lids creating inflammation. This is a disease known as blepharitis. This type of dry eye has traditionally been treated by home scrubbing the eye lids with baby shampoo along with prescription eye drops. Both treatments have only been mildly effective in providing relief for "crusty" eyelids. To effectively treat blepharitis, Summit Eyecare has also invested in the BlephEx system which is another cutting edge treatment specifically designed to treat this disease. This procedure is performed in-house with minimal discomfort, only taking a few minutes and is very effective. Review the video below for more information. There are many causes of chronic dry eye. Make an appointment with one of our doctors at Summit Eyecare and allow them to diagnose the exact cause. Throw away the bottles of artificial tears and stop suffering from those tired, irritated and dry eyes. Call one of our four locations and enjoy clear, comfortable vision again! "Experts in eye care, both Dr Birch and Dr Fleming are excellent in their profession and care for their patients. I would recommend both for yours and your family's eye care.